Each row represents one of the 51 European groups (labels at right) that were inferred by clustering the 6,029 European samples using fineSTRUCTURE. Only European groups that make at least 2.5% contribution to the ancestry profile of at least one UK cluster are shown. Each column represents a UK cluster. 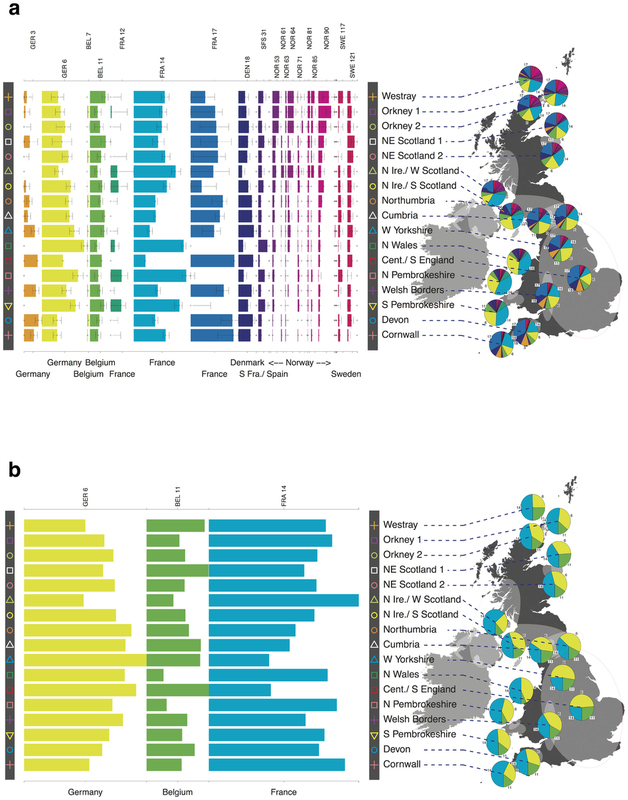 Coloured bars have heights representing the proportion of the UK cluster’s ancestry best represented by that of the European group labelled with that colour. 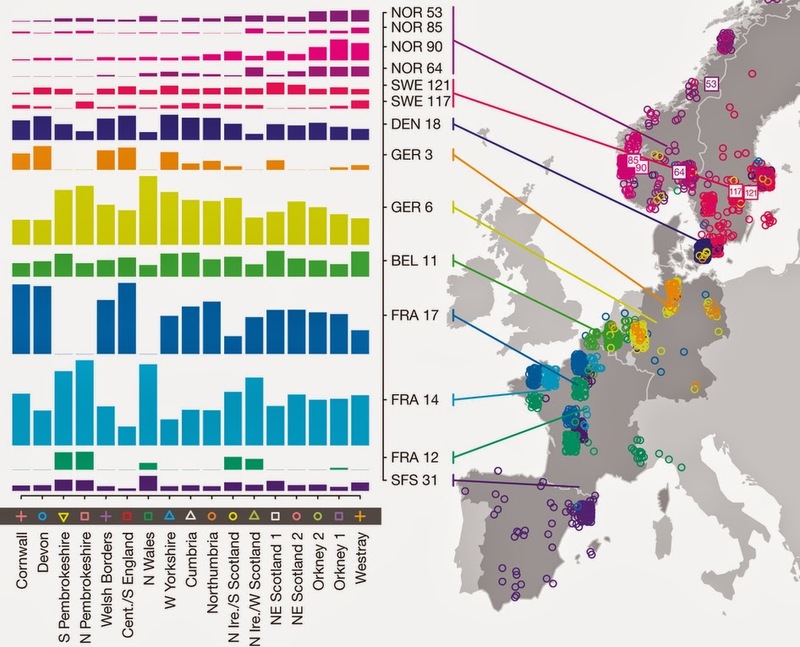 The map shows the location (when known at regional level) of the samples assigned to each European group (some sample locations are jittered and/or moved for clarity, see Methods). Lines join group labels to the centroid of the group, or collection of groups (Norway, Sweden, with individual group centroids marked by group number). © EuroGeographics for the administrative boundaries. a, The routes taken by the first settlers after the last ice age. b, Britain during the period of Roman rule. 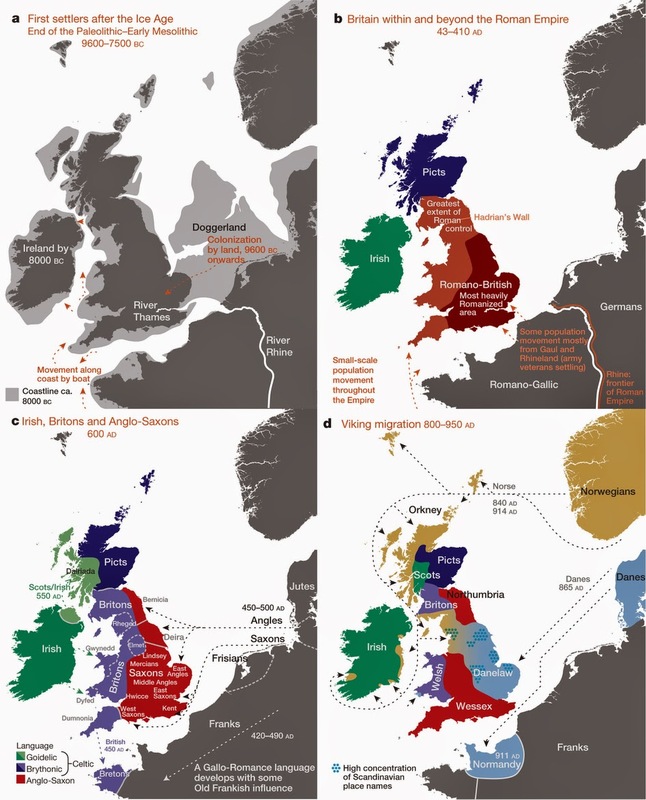 c, The regions of ancient British, Irish and Saxon control. d, The migrations of Norse and Danish Vikings. The main regions of Norse Viking (light brown) and Danish Viking (light blue) settlement are shown. © EuroGeographics for the administrative boundaries (coastlines). Figures, Extended data figures and full article.